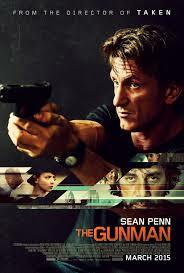 Sean Penn is another actor whose work I’ve seen a bit of, starting with The Interpreter. Since I knew I liked him as an actor, when I was looking for a film to see today, I decided to go for this one. As thrillers go, this movie was an effective one. There were some good elements of foreshadowing in this and I found myself able to relate well to Sean Penn’s character. The love triangle wasn’t as irritating as a lot of love triangles, but I found myself less than thrilled with Annie. I struggled to relate to her as a character and found her much harder to understand than Felix, for instance. There was quite a lot of action in this movie and the danger that Terrier was in felt real. I found the use of the news reports at the beginning and end of the film to be quite effective. I did feel that Terrier was an intriguing character with realistic strengths and weaknesses. I could get behind him as a character and I cared about his safety. I liked his interaction with his friends and I found myself rooting for him through most of the movie. There were things I would have liked to see more of in this film… character arcs I would have liked to see more of. And there were a few scenes in this that left me a bit lost. But the tension was enough to keep me watching and I liked the main character in this movie. I don’t think I’d watch it again… but it was still an entertaining couple of hours.